Where can I find Send Render to button? Nwe version of POSER 11 Pro, I cant find the [Send Render to] button. How can I render images by Queue Manager? @tomo I think this is what you're looking for. OP has the movie settings tab open, so it appears that he's wanting to send an animation off to queue. As I recall, some bug appeared and the devs removed the send render to button to avoid that bug. I believe the service release currently being worked on will restore the send render to button. In the meantime, sending individual frames to queue (i.e., making a batch list) is the only workaround of which I'm aware. @seachnasaigh Ahhh, I hadn't noticed he was trying to send an animation to Queue. @seachnasaigh @tomo You are correct. When I emailed tech support they said they took the feature out, it was not working correctly. Too bad too because in theory it's a great function imo. Hope they will bring it back. @seachnasaigh How do you make a batch list and send individual frames to que? I am curious to try this and see how it works. @seachnasaigh How do you make a batch list and send individual frames to que? Each time you send a frame to queue, Queue Manager adds a "job" to its list of renders to be done. That's called a batch list. The process is simple, but it's irritating to do these steps repetitively for an animation. As I said earlier, I believe the next SR will restore the Send Render To button. @anomalaus provided a temporary Python workaround hack in the thread I quoted this post from. For anyone looking for a simple, interim solution to batch rendering images in QueueManager with Poser Pro 11.1.1.35510, here's a simple Python script which will prompt the user for a destination folder and base filename, then render the frames selected in the Render Settings Movie tab in the queue, in the absence of a button to do that directly from the UI. It defaults to save individual PNG files at the moment, since Poser's Python API doesn't expose the SaveImage file type chooser with the list of available image types. If anyone's desperate for such a feature, let me know and I'll see what I can do. If you change the ".png" Image File extension in the dialog to one of the other accepted file formats (PNG, TIF, BMP, TGA, JPG, PSD or EXR), it should use that (the extension is case insensitive). Select, copy and save the code below as MovieRenderToQueue.py somewhere in your Poser Python hierarchy. # Since PoserPro 11.1.0.35510 removed the RenderToQueue button from the MakeMovie dialog, replace its functionality. # This is still possible, since the poser.Scene().RenderToQueue() method still includes the isMovie flag. # v1.0	20190206	Initial version. Prompt user for file path to save the rendered movie or image files. #					Initially defaults to PNG image files as Image file type picker is not exposed to Python yet. 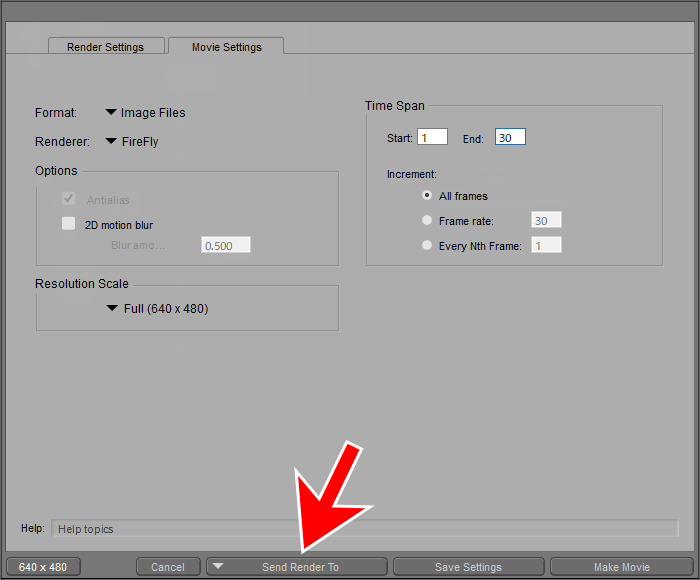 Don't forget to setup the Movie frames, renderer and Image Files selection in the standard dialog, first. @tomo An option I failed to offer is to re-install build 34338, which still had the Send Render To button. Also re-install 34338 of Queue on any remotes (render slaves) you have. The Send Render To has been put back in and is now live.